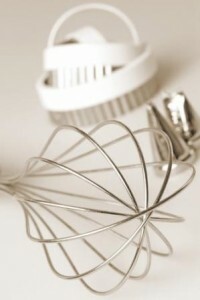 We all have our favorite kitchen tools, those that are indispensable and we couldn’t live without. It is hard to narrow down what my favorite one is, though I’m definitely a little bit of a gadget junky. I even have a mandolin (wedding present) that has been sitting in my cabinet that I’ve never used. One of these days, I’m going to give it a try. I’ve finally started using my cast iron skillet, and I love it. Of course my slow cooker is indispensable and I use it weekly. My pressure cooker is definitely becoming a favorite as well, having worked its way onto my weekly menu rotation too. I have two food processors: a large one and a small one. I use the large one for making my own hummus often. The small one is great for breadcrumbs and vegetables. If hard pressed though, I think one of my favorite tools is my immersion blender. I use it more than anything making smoothies. I much prefer this to my blender as it is much easier on clean up – my blender is just so clunky and hard to clean, especially for just one smoothie. But the immersion blender is perfect. 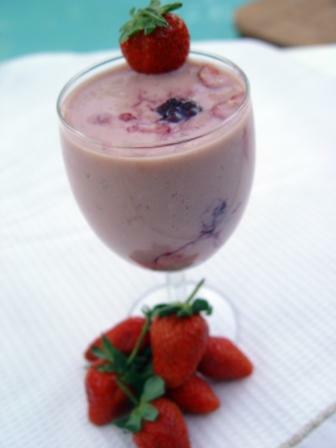 I have a large glass that is just the right size for mixing my smoothies and accommodates the blender with ease. The immersion blender is also indispensable for pureeing soups. I love making my own soups – they taste so much better than canned; not to mention much lower in sodium. But it can be used for a variety of purposes; I’ve used it for batters, sauces, etc.